The second Professor of Chinese in the University of Oxford was Thomas Lowden Bullock. Bullock had studied at Winchester and New College, from which he made a natural progression into the Consular Service. He served as British Consul in Formosa (as it was then known) for most of the 1870s, and then in various mainland locations until he was forced to return to England on the grounds of ill health in 1896. He was appointed to the Oxford chair in 1899 (two years after the death of the first professor, James Legge) which he occupied until his own death on 27 March 1915 at the age of 69. All works added to the collection must be in Chinese. Exceptions are only made for the purpose of keeping historic collections together, and then only when the number of non-Chinese items is very small. Works of exceptional monetary value (which usually makes them rare). These criteria make the collection “special”, but not necessarily “old”, and I think few librarians would disagree with them. The book described above is undoubtedly special, as I will show in a moment, but not really “old” by the definition “1911 or earlier”. In an attempt to circumvent this arbitrary date-setting, I came up with the expression “pre-modern” to define my project, but there are difficulties even with that. By “pre-modern”, I meant books that were composed more or less entirely within the limits of traditional Chinese civilisation, before the significant intrusion of western thought-patterns. This would allow me to include, for example, Piet van der Loon’s large collection of Cantonese muyushu 木魚書, most of which were published in the Minguo 民國 period, many of them in Hongkong as late as the 1950s and 1960s. But what about the works published by the Jesuits in the 17th century, which were published entirely outside the limits of traditional Chinese civilisation? Here we must revert to my earlier set of criteria. And so the standard is fluid, and boils down to personal judgement. The only qualification for inclusion possessed by the book I have described is that it is rare. Having searched the main online Chinese union catalogues (principally CALIS, NII, and WorldCat) and many more besides, I have so far found only a single copy apart from ours, in Tsukuba University Library 筑波大学附属図書館 in Japan. I don’t know what is meant by “large book shops”, and it is odd that no American library seems to have a copy. That it was sold on the market is attested by the printed price (每冊大洋一元二角五分), but Bullock presumably got his copy through a personal contact, perhaps one of his old friends in the Consular Service. As an early reaction from a major western government to the first Chinese Revolution, the text of this British Parliamentary Blue Paper was considered sufficiently interesting to be reprinted in 1968, when it was reproduced together with a work entitled 「辛亥革命與列強態度」, being translated selections from a later German work on the same subject, Die grosse Politik der europäischen Kabinette, 1871-1914 (Berlin, 1927); this combined edition was reprinted again in 1983. I will not dwell on the appalling visual mess which greets the reader who wants to examine the details of this edition in WorldCat, which require a full three pages to print out. But it you persevere, you will find that all the entries give the date of the original Chinese edition of the Blue Paper as 1912 (民國元年). So do the entries in all the other online catalogues. 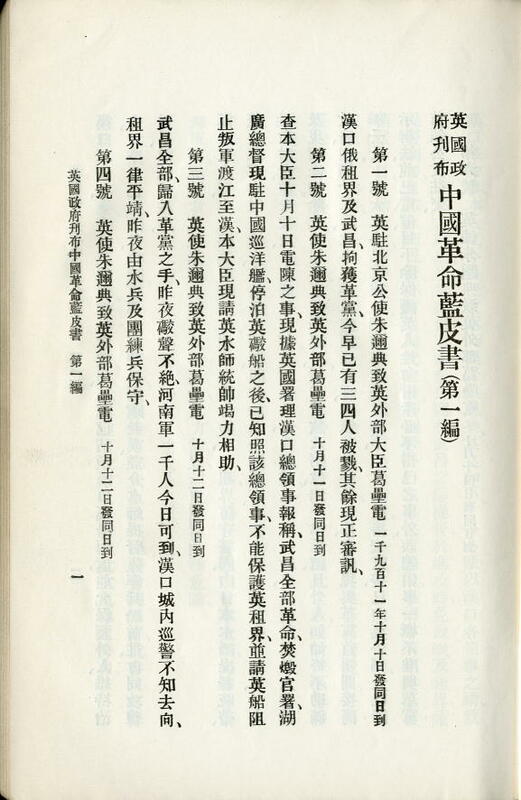 The most concise and intelligent publication note is in the National Library of China’s catalogue entry, and reads 「原文1912年5月出版，译文中华民国元年(1912年)9月付印」, that is, sent to be printed in September 1912, not necessarily completed in that year. Actually, the printing could scarcely have been completed in 1912, and certainly not in September, because the prefaces of Sun Wen 孫文, Wu Tingfang 伍廷芳, and Wang Chonghui 王寵惠 are dated 21 December, 18 December, and 25 November respectively. 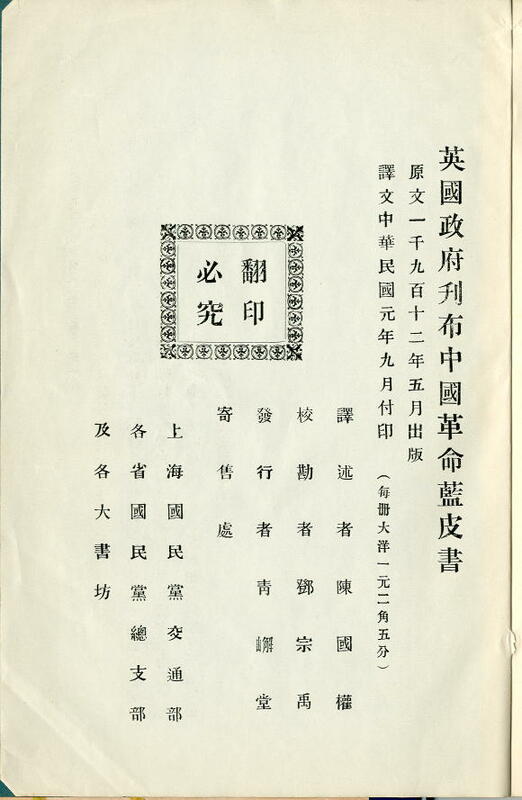 The calligraphic title-page and cover are clearly dated 1913 (民國二年).